The breakthrough festival of the international underground scene, which will take place from 29th of December to 13th of January in Tulum (México), also reveals the location of the event featuring Afterlife. Adriatique, Âme, Mathame, Mind Against, Recondite (live), Return, Stephan Bodzin (live) are Tale Of Us’ stellar selection for this event, scheduled on Wednesday 9th of January in Zamna Tulum cenote. It was already revealed that on Wednesday 9th of January Sound Tulum will be hosting Afterlife, one of the leading electronic music brands worldwide. Now, its location has been announced, Zamna Tulumcenote, its schedule, from 8pm to 11am, and its complete line-up. 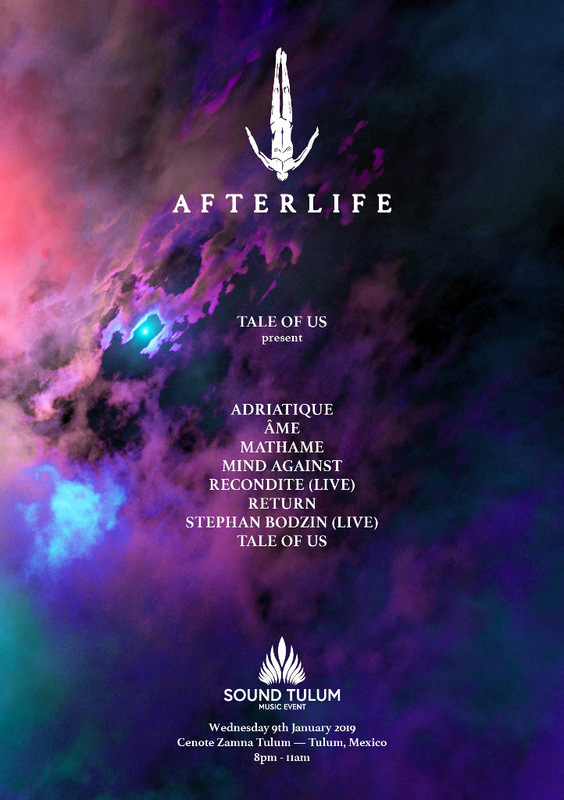 An absolutely stellar selection from Afterlife that includes Adriatique, Âme, Mathame, Mind Against, Recondite (live), Return, Stephan Bodzin (live), and of course, the hosts Tale Of Us. ► Early Bird 50$ (USD): SOLD OUT. ► 1st Release 70$ (USD).